French President Francois Hollande held a meeting with Russian President Vladimir Putin on Thursday in Moscow and discussed counter-terrorism efforts, focusing on coordinating an international activities against ISIL. Russian President Vladimir Putin said that terror attacks have forced Moscow and Paris to unite efforts. 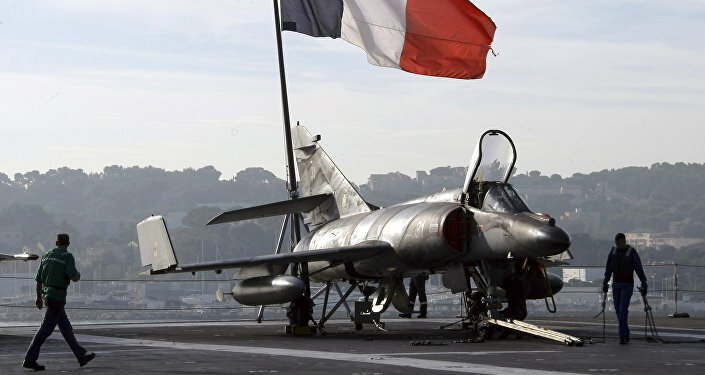 "We grieve with you over the losses that France suffered, these are major losses. According to the latest data, as far as I know, 130 people are confirmed dead and over are 350 injured. You know that Russia has suffered serious losses as a result of heinous terrorist act against a civilian aircraft [in the Sinai Peninsula]. All this forces us to join efforts against a common evil," Putin said. Russia and France became targets of terror attacks conducted by ISIL militants, who claimed responsibility for both the explosion aboard a Russian A321 passenger airliner on October 31 and the November 13 deadly terror attacks in Paris. France calls for a broad and strong coalition in the fight against terrorism, Hollande said during a meeting with the Russian leader. Putin said that Moscow and Paris shared similar stances concerning the creation of a broad coalition to fight terror. "We see that you pay a lot of attention and make efforts to create a broad anti-terrorist coalition. You know our position and we are ready for joint work. 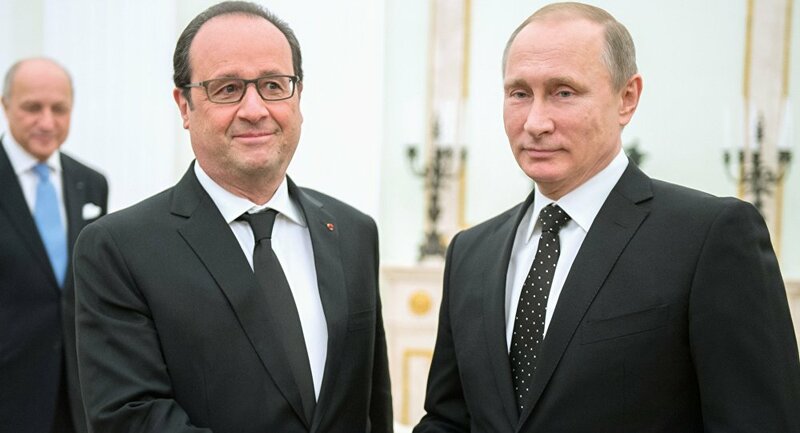 Moreover, we believe it is absolutely necessary, our stances are similar in this regard," Putin told Hollande. 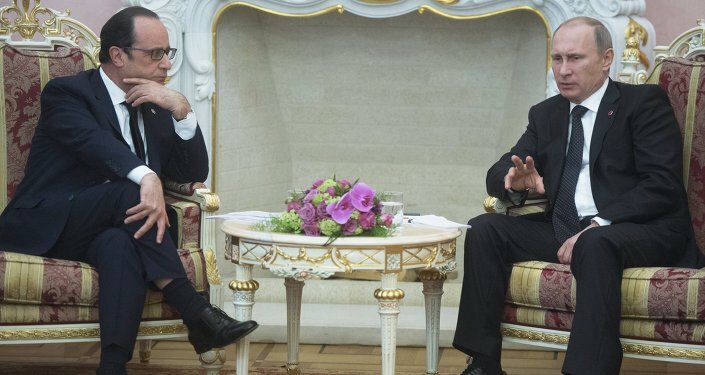 Hollande said that he came to Moscow to coordinate joint actions aimed to legitimally fight against terrorists. "This is why I am here in Moscow, with you, to jointly find a solution on this path, to coordinate efforts to effectively fight against a common enemy," Hollande told Putin. "We know that terrorism is our common enemy, that it has territory, an army and finances, so we must create this broad coalition to strike at these terrorists," the French president added. Hollande's decision to visit Moscow opens the way to forming a broader united anti-terror coalition, previously requested by Russia. Russia's push for the coalition was expressed in President Putin's September 29 speech at the UN General Assembly. Last week, Hollande announced his intention to conduct an intensive diplomatic tour, visiting Moscow and Washington. The announcement came in the aftermath of the November 13 attacks in Paris, in which extremists killed 130 people and injured over 350. ISIL claimed responsibility for the attacks. During this week's tour, Hollande also met with British Prime Minister David Cameron on Monday. A meeting with German Chancellor Angela Merkel was held on Wednesday evening.